Fast economic growth - in excess of 5% per year - continues in most New EU Member States (NMS). Growth in Bulgaria and Romania (which joined the EU on 1 January 2007) was also accelerating throughout 2006. Everywhere, except Hungary, GDP growth has been driven predominantly by domestic demand. External trade, which significantly boosted GDP growth in a number of NMS in 2005, has been losing significance and continues to be a drag on growth in Bulgaria and Romania. wiiw growth forecasts of the GDP in individual NMS in 2007 and 2008 are looking very good. It is expected that household consumption will continue to rise strongly. Rising employment and wages (strengthening under the impact of emerging labour shortages) will be supportive. Rising remittances of migrant workers would be adding to fast rising consumer spending. Gross fixed capital investment is expected to remain strong in most NMS. With the exception of Hungary, fiscal policies will not interfere with real growth. The slight deceleration of growth in the EU-15 expected in 2007 is not likely to restrict the growth of both NMS exports and their overall GDP too much as further gains on industrial unit labour costs are expected. Given the ongoing structural changes and quality improvements in production and exports, the NMS should continue to gain market shares even despite further currency appreciation. However, growth in imports responding to growing domestic demand will be reducing the contribution of trade to GDP growth. This contribution is likely to be negative in the 'old' NMS, but small. In Bulgaria and Romania, the contributions of external trade to growth will be negative and large. Unlike the 'old' NMS, these two countries will be running very high current account deficits and rely on rising private foreign debt in order to finance consumption and investments. The risk of making big errors in growth forecasts for the 'old' NMS is fairly low. Their fundamentals are nowadays much sounder than in the past (Hungary being temporarily an exception). The rates of inflation are quite low and firmly under control. Interest rate differentials vs. the major international currencies are also low, falling, or even negative. Incentives for potentially destabilizing speculative capital inflows (and outflows) are therefore weak. Nominal currency appreciation is likely to continue, signifying the NMS' economic strength rather than potential weakness. The estimates of GDP growth rates for Bulgaria and Romania may be less certain. Both countries are growing turbulently. But, as in the Baltic countries, their growth is to a large extent induced by booming household consumption which is credit-driven and fed by excessive imports. Yet the experience of the Baltic countries indicates that such a type of growth can go on for a very long time. However, there are many examples of such debt-financed expansions coming to a rather sticky end. Thus, it might come as no surprise were the rising debt burden to put a lid on further expansion in Bulgaria and Romania. The Balkan economies continue to grow despite political risks and external shocks. Consumption is the main source of growth, with investments also increasingly contributing. High exports are accompanied by high imports and external balances remain strongly negative. Price and exchange rate stability, however, remain manageable because of strong growth of productivity and downward pressure on wages from excess supply of labour. The expectation of sustained growth is supporting growth of foreign investments in privatized assets but also increasingly in green-field projects. Fast rising prices of assets and declining interest rates due to strong credit expansion are proving worrisome for the central banks, which fear asset bubbles and weaknesses in the banking sector. These challenges are met with a tightening of monetary policy, which has led to some moderation of growth rates. Overall prospects are positive for growth and stability in the short and medium run. The main risks to positive expectations emanate from remaining political problems and from doubts about the process of EU integration and accession. The major political risk is connected with the upcoming decision on the Kosovo status. If that risk is managed well and if other political problems are addressed that will make it possible for all the countries in the region to either sign association agreements with the EU or continue or start negotiations on membership in the EU, rather positive economic news should be coming out steadily from the Balkans. That would also help the region to address the serious social risks, especially those connected with high or very high unemployment. Overall, prospects for growth are good in the short and medium run and prospects for stability are risky in the short run and good in the medium run. The region as a whole should be included in the EU by 2015, except perhaps for Kosovo and Turkey. Russian economic growth was once more over 6% in 2006, the cumulated GDP has increased by more than 40% since 2000. GDP growth is driven by the surging private consumption, recently also by investments. Owing to sluggish exports and booming imports, the contribution of real net exports to GDP growth has been negative already since 2003. The economic outlook remains positive with both consumption and investments (including FDI) growing rapidly. 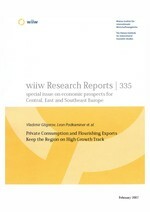 However, wiiw expects growth to settle between 5% and 6% in the coming years. With more oil and gas money as well as power consolidation at home, Russia's self confidence will grow further. In Ukraine, GDP growth accelerated markedly in 2006; macroeconomic imbalances were largely avoided and the 'gas price shock' reasonably well digested. Foreign debt increased by some 25%, reaching 47% of GDP by the end of the year - mainly caused by the banking sector's rapidly growing external borrowing, possibly associated with the growing presence of foreign banks. Inflation apart, the country's short-term economic outlook is good. In 2007 2008 we expect economic growth close to 6%. Despite the persistent stand-off between the president and the prime minister, the country is now living through a period of its greatest political stability since the 'orange revolution'. In China, GDP grew by 10.7%, driven by investment and an exploding trade surplus but supported by private consumption as well. For 2007-08, prospects remain good but a slight deceleration of growth may occur, due to a certain slowing down of investment and measures to contain the trade surplus.